The Planning and Zoning Commission has prioritized and selected the goals of the 2020 Plan to work on implementing in 2014. The Commission reviewed the 2020 goals and the results of a survey sent to 2020 participants and the general public seeking their input. 1. Invest in attracting and expanding desirable industries. 2. Redevelop and invest in existing and potential corridors and activity nodes. 3. Create an arts and cultural district. The next steps include identifying other stakeholders to work together to develop more specific, concrete steps to begin the process of making the goals a reality. You can keep track of this process at this site and on the planning department’s Facebook page. Now that Manchester 2020 has been adopted, it's time to begin the implementation process. The Planning and Zoning Commission wants to turn the Plan into a work agenda. At the link below you will find a survey intended to help create a priority work agenda for the first years of the plan's implementation. Do you have an opinion about which items of the Plan should be emphasized? The Town is interested in hearing your opinion. The survey below offers an opportunity to make your voice heard as we work towards making Manchester a more vibrant community. We were out of commission for a few weeks but things are now back to normal. 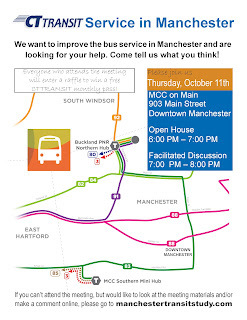 Please join the Town of Manchester and the Capitol Region Council of Governments (CRCOG) on Thursday, October 11th for a public meeting on improving public transit in Manchester. The event will take place at the MCC on Main Gallery, 903 Main Street. An Open House will be held from 6:00-7:00 and a facilitated discussion will begin at 7:00. 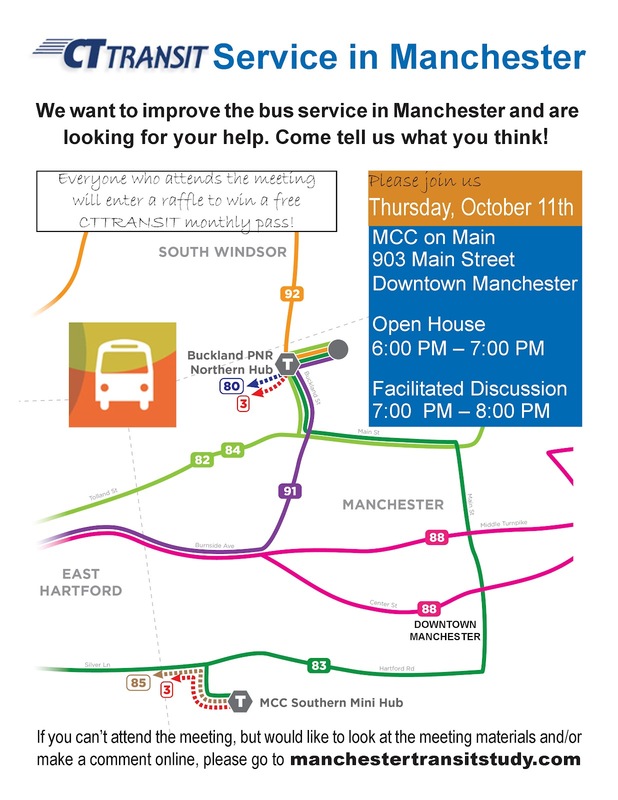 The Manchester 2020 Draft Plan recommends improving public transit within Manchester and better connecting Manchester with upcoming regional transit improvements including commuter rail and bus rapid transit. This study and this meeting will directly address these goals and look at how existing bus service could be enhanced and improved. We hope you will attend to share your thoughts and ideas. The Manchester 2020 Plan is Here! It has been a long time coming, but the Manchester 2020 plan is here! The Planning and Zoning Commission adopted the Plan on December 17, 2012 and it will be effective on January 14, 2013. The Commission will move onto implementing the recommendations in the Plan. Click on the links below to access a pdf of the Executive Summary and the full document. Thanks again for your interest and participation in Manchester 2020! 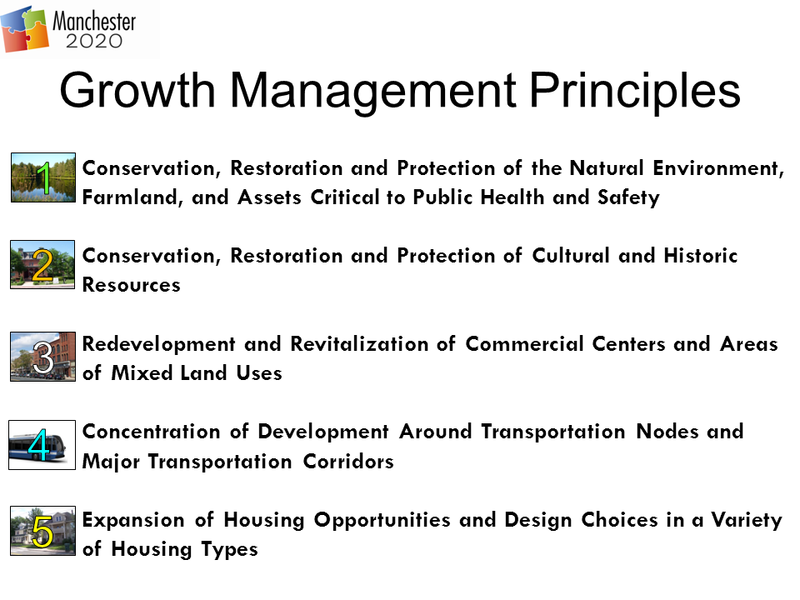 The following slides include the draft Manchester 2020 recommendations from the March 13 Recommendation Roll-Out at Manchester Country Club. The Planning and Zoning Commission and Planning Department staff are interested in your comments. Please use the comment section at the bottom of the post to provide your comments, suggestions or questions. You can enlarge each slide by clicking on it. This slide shows how the recommendations are organized. 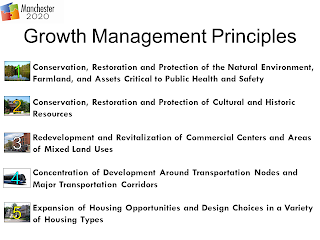 This slide shows the five growth management principles. This is a final reminder about tomorrow evening's Recommendation Roll-Out. Tuesday, March 13 at 7 PM at Manchester Country Club. We hope you plan on joining us to provide comments and suggestions on the draft 2020 recommendations, which are available HERE. Please call the Planning Department at 860-647-3044 with any questions or to RSVP.